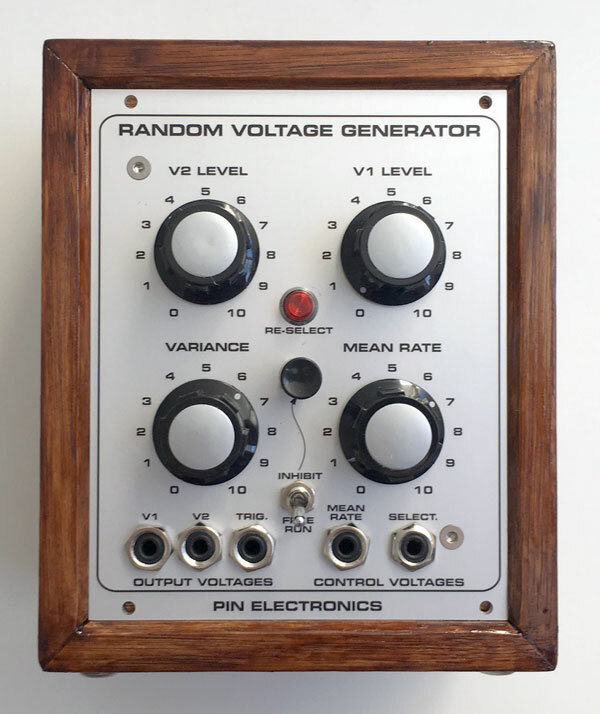 The Voltage Random Generator from the 70s. Euro rack version: Price 399,00 € ex. VAT & shipping / without wooden box! Order via contact form & we’ll get back to you shortly! The The Random Voltage Generator based on the legendary EMS two-voltage random generator from the 70s. If the time variance control is at zero, the mean rate is constant (though subject to change of steady rate if influenced by a control voltage). As the time variance control is tuned clockwise, the mean time random variance becomes greater, and when this control is at maximum the rate will randomly vary in a ratio of more than 100:1. The distribution of chances is rectangular, not Gaussian, so that no part of the variance range is particularly favoured. Time: The internal clock which decides the mean rate of events can be (1) free-running and subject only to manual control, (2) inhibited so that the next random voltage depends on a manual push button or an external pulse (equivalent to external clock control); (3) free-running but voltage controlled so that an external voltage influences the mean rate. In this state the device becomes a voltage/time converter. Voltage: Two voltage outputs are available and separately adjustable, but both are subject to the same time control — i.e. the steps of the staircase occur at the same time from both outputs. At zero, there is no voltage variance at all, and as the setting is increased the variance about the mean voltage (set at the device being controlled) becomes greater, excursions being both positive and negative of the mean voltage. In addition, a trigger pulse is sent whenever a random selection is made, and a lamp on the panel glows at the same time.